Adornment is defined as “a thing that adorns or decorates; an ornament.” For Grayscale, the word serves as the title of their Fearless Records debut, where intricate elements and motives weave seamlessly throughout—each song containing its own puzzle piece, or ornament—to adorn a bigger story. 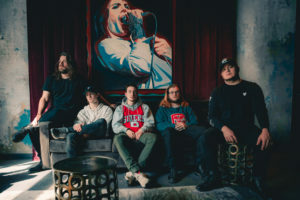 The Philadelphia-based quintet is composed of vocalist Collin Walsh, guitarist/vocalist Dallas Molster, guitarist Andrew Kyne, bassist Nick Ventimiglia and drummer Nick Veno. Through their unbarred emotion and unique blend of alternative rock and punk roots, Grayscale utilizes these components to explore the juxtaposing ideas of beauty and affliction.